Players looking forward to now being teammates with the Nathan Hale star as part of Washington's touted freshman class. Garfield seniors Jaylen Nowell and Daejon Davis on Tuesday had their first encounter with Nathan Hale senior Michael Porter Jr. since the Class 3A state championship game where Porter closed out the scoring with flare. The trio met in Bothell at The Seattle Times’ North Creek Production Facility for a photo shoot as part of the 2017 Star Times boys and girls basketball team that will be announced Tuesday. The gathering of the area’s top 12 players allowed for some reaction to Nathan Hale’s state championship win against Garfield on Saturday. Porter, a 6-foot-9 McDonald’s All-American, collected an in-bound pass and tossed himself an alley-oop off the Tacoma Dome backboard with 38.3 seconds left in the game for an eye-popping finish. A timeout was immediately called, Raiders coach Brandon Roy leading a rush to the court to celebrate the dunk. Nowell has moved on, but won’t forget the image of the final seconds of his last high-school basketball game. Garfield has played in two of the past three title games, winning in 2015. Davis, a 6-4 point guard, wasn’t on the court at the time due to suffering a minor right knee injury with 6:24 left in the game. He said Tuesday that he’s fine, but didn’t watch the play because of the double dose of pain from the injury and loss. In a twist, the trio are now teammates as expected incoming freshmen at the University of Washington. The touted class hinges on the job stability of men’s basketball coach Lorenzo Romar, however. Porter stated Tuesday his commitment is to Romar and his father, Michael Porter Sr., who was hired to the coaching staff last year, not UW. Porter, who finished the game with 27 points and 17 rebounds, agreed. 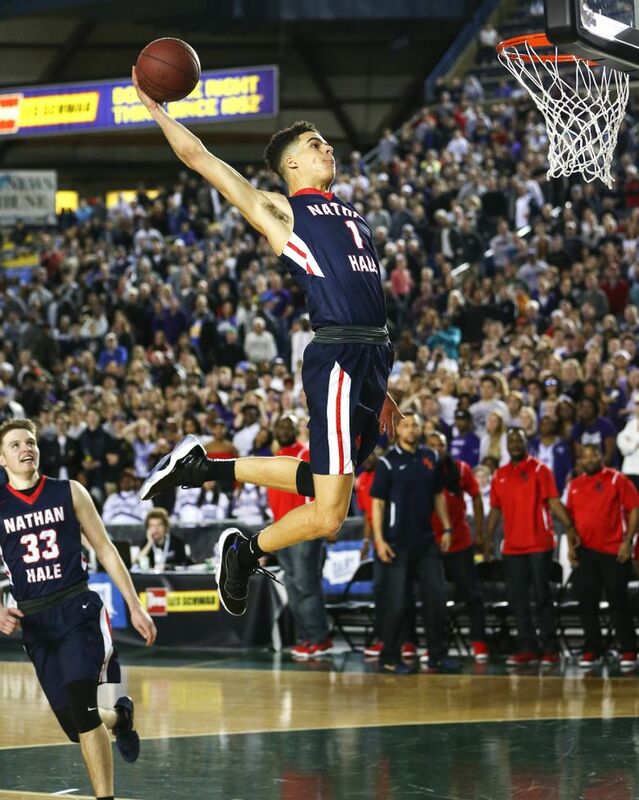 The championship is Nathan Hale’s first for boys basketball, the team finishing the season at 29-0 and regarded as the top high-school team in the nation.